This section contains key concepts related to working your way through the stages of an interview. When you enter the Interview page of a participant, you obtain a lock on the interview. No other user can access the particpant’s Interview page until you exit the Interview page properly (by selecting an Interview Exit button— see Interview Exit buttons). If Onyx crashes or if you exit the Interview page improperly (by selecting the Onyx Exit button—see this figure), a participant manager will have to unlock the interview. See Unlocking an Interview. An interview stage passes through various statuses from “ready” to “completed”. Each type of stage (consent, questionnaire, physical measurement, specimen collection, interview conclusion) follows a particular path through the statuses. The Actions that are available depend on the Status of the stage Each study defines the conditions that are required for a stage’s status to change. 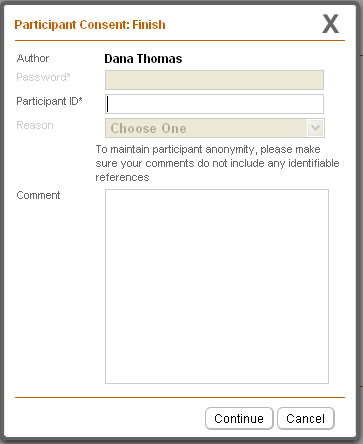 A study can customize the names of the statuses that appear in the Interview page. The Actions column lists the actions that are available to you for a particular stage of the interview. The Actions depend on the status of the stage. Each study defines the actions that are available when a stage has a certain status. A study can also customize the names of the actions that appear in the Interview page. Despite all the customization that Onyx allows, only five stage actions are possible: By default, the actions have the names indicated in this list. Start — You select this action to start a stage. Skip — You select this action to skip a stage. Some examples of why you might need to skip a stage: the stage is Not ready; it is more convenient to do the stage later; another staff member is responsible for the stage. Reinstate — You select this action to redo a stage that was skipped. Cancel — You can cancel a stage that is contraindicated or not applicable for some reason. Review — You can review a stage that was contraindicated in order to determine if the contraindication is appropriate or, if the answers that caused it should be corrected so that the contraindication will be removed. Closing an interview means ending the interview early before all stages have been completed (or skipped, if your study permits). The participant is not withdrawn from the study. Cancelling an interview means withdrawing the participant from the study. The decision to withdraw a participant may come from the participant or a staff member. CAUTION: If you select the Close or Cancel button in the Interview page, you will not be able to continue the interview with the participant later. If you want to leave the Interview page temporarily and continue the interview later, you need to exit the Interview page this figure. Each study defines what will be done with the data acquired to the point of closing or cancelling an interview. You can review a stage if its status is Contraindicated. If you review the stage and change the condition (for example, the answer to a particular question) that caused the stage to be contraindicated, you can actually change the status of the stage from Contraindicated to Ready. You can reinstate a stage that was skipped. When you reinstate a stage, its status will change to Ready and it will be possible to Start the stage again. Depending on how your study customized Onyx, Onyx may display an action window when you select an Action in the Interview page. These windows usually require you to enter your password and the Participant ID (you can scan the barcode or enter it manually). An action window may contain other fields depending on the action that you selected and how your study customized the window. The purpose of action windows is to ensure the integrity of the data being collected. When you enter your password, you confirm that it was actually you who carried out the action. When you enter the Participant ID, you confirm that the data is indeed being collected for the correct participant. :ref:`this figure <action-windows>`shows an example action window. When you are in a stage, you will see various buttons at the bottom of the page. These buttons allow you to move back and forth through the pages of the stage and to finish the stage. See this figure. By default, the buttons are named as shown in See this figure. Your study may have changed the names on the buttons. Next button — Select it to display the next page in the stage. Previous button — Select it to display the previous page in the stage if you need to check or change something in that page. Finish button — This is only displayed when you are on the last page of a stage. You select it when you are ready to complete the stage. You can also use hot keys to navigate through the pages. See Hot Keys Hot Keys. The Administration button is always displayed at the bottom of the page during an interview stage. When you select the Administration button, the Administration dialog is displayed. See this figure. You access this dialog when you need to pause or cancel the stage. For a questionnaire stage, the dialog includes First and Last buttons. These buttons allow you to jump directly to the first and last pages that need your input. If no pages require your input, they jump to the first page or last page of the questionnaire. To make the task of completing long questionnaires easier, Onyx allows you to use certain keyboard keys in a special way. When you are working in a stage, you can use these hot keys instead of having to use the mouse to select buttons. this figure lists the hot keys available during interview stages. Next The + key on your keyboard Displays next page of the stage Don’t press Shift. Works for all kinds of stages, but not on the last page of a stage. Finish The F key on your keyboard Finishes the stage. The stage closes and you are returned to the Interview page. Don’t press Shift. Works for all kinds of stages, but only on the last page of a stage. Administration The A key on your keyboard Displays the Administration dialog. Don’t press Shift. If a text field is selected (the focus is on the text field), this hot key will not work. This is so you will be able to enter the letter “a” in the text field. In the Interview page, a log contains a list of system messages and user comments. A log can either be about the interview as a whole, or about a particular stage of the interview. The list is in chronological order—the oldest entry is at the top, and the most recent entry is at the top bottom. In the Interview page, a comment list only contains comments added by users. Depending on which button you select, the list of comments will either be about the interview as a whole, or about a particular stage of the interview. The list is in chronological order—the oldest entry is at the top, and the most recent entry is at the top bottom.